Before you pop, you want to have your shoulder wound up already, with your arm across your stomach. As you pop, scoop your foot forwards, unwind and start rotating in the frontside direction. As you reach the apex of your Ollie, your board should have already rotated 90 degrees. As with the backside 180 Ollie, remain centered when you rotate. You don’t want to be moving all over the place- you just want your legs and the board to rotate 180 degrees. After you reach the height of your Ollie, quickly twist your legs, bringing your back foot forward, to complete the turning motion. Landing the frontside 180 Ollie is easier since you are facing forward the entire time and you get to see where you land. However, there is still a tendency to land with too much weight on your font foot and having the board shoot out from under you. Fix this by remaining centered and staying over your board while bending your knees as you land. With both the frontside and backside 180 Ollie, you want to practice while rolling at a slow, comfortable speed. It is very difficult to learn this trick stationary because you need some momentum to turn the whole 180 degrees. This is just a preview. The entire section has 296 words. 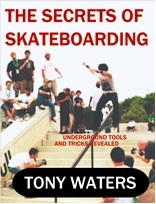 Click below to download the full Secrets of The Secrets of Skateboarding.